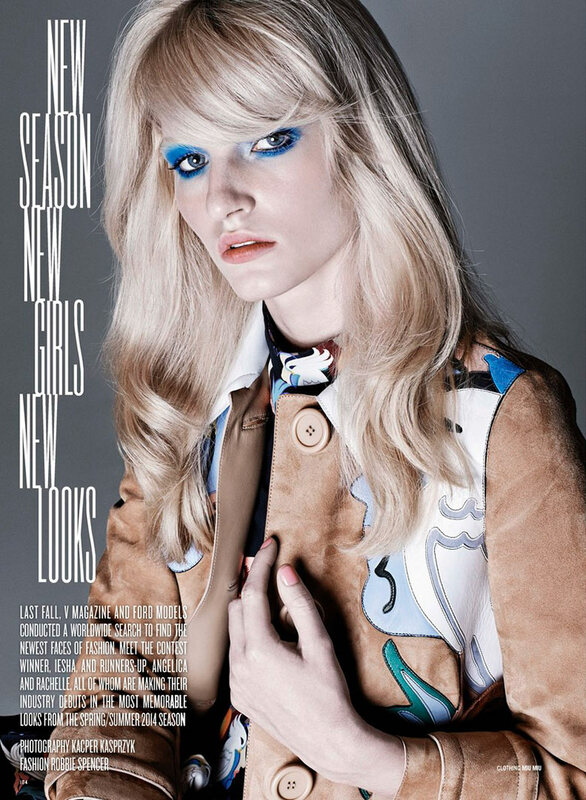 New girls are taking on the fashion scene when debuting in Kacper Kasprzyk’s spread for V Magazine spring 2014. When V Magazine and top modeling agency Ford teamed up for the global search to find the new and fresh face of the modeling industry one knew that the outlet would be something remarkable, and so it was. Winner Iesha Hodges and runners-up Angelica Cooper and Rachelle Porter are all bringing new looks and individuality to the modeling business. Captured by photographer Kacper Kasprzyk, the newcomers are posing the freshest fashion wear styled by Robbie Spencer. From Givenchy, Prada and Celine to Calvin Klein and Christopher Kane the rookies are working their striking bodies while getting presented to the public. Make-up artist Gemma Smith-Edhouse has graced Kasprzyk’s editorial with her innovative make while hair stylist Duffy has embraced the model’s hair with panache. Judging by this creative spread, we have no doubt that this won’t be the last time we see these amazing girls gracing the fashion scene.